43052 passes Compton Beauchamp on 15 September 1979 with the late running 12:45 Paddington to Swansea service. 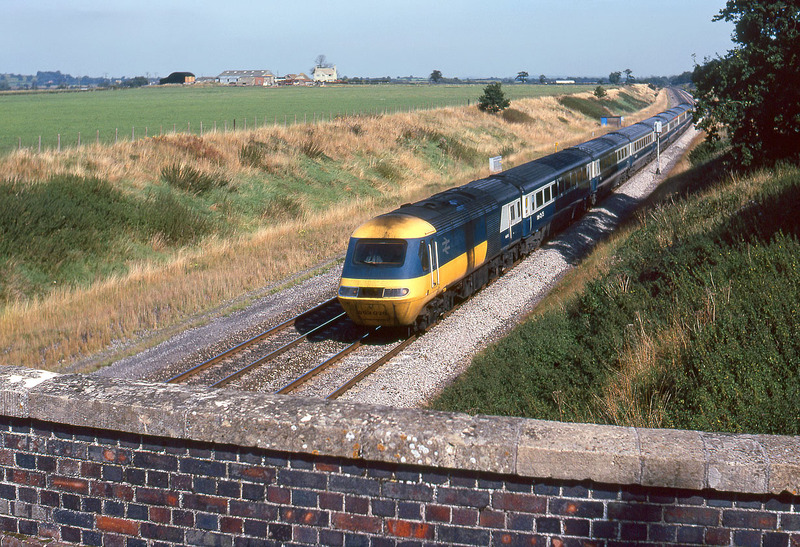 This particular set (253026), which included power cars 43052 & 43053, was one of a small batch that moved from the Western Region to the Midland line during the first major reshuffle of HSTs vehicles in late 1982. 43052 is pictured here in original condition with the two large circular exhaust ports on the roof as yet uncovered by the deflector plates that were added to stop exhaust contamination of the cab roof. It wasn't until I came to scan the original Kodachrome slide that I realised that the house at Galleyherns Farm in the background was obviously newly built in 1979.